A native Michigander, Charles D. Long was born in Grand Blanc on June 14, 1841. As a youth, he was educated at local schools and prepared himself to enter the University of Michigan. During this time, Long also taught school in order to help others, as well as further his preparation for college. When the Civil War began, however, his plans were drastically altered. Long enlisted in Company A of the 8th Michigan Infantry. On April 16, 1862, he sustained two severe wounds at the Battle of Wilmington Island, Georgia. He lost his left arm and a bullet was lodged in his inner thigh, where it remained for the rest of his life. Long’s bravery and strength have been noted by many in dealing with such a terrifying situation. Upon his return from the war, Long began studying law, and in 1864 was elected County Clerk for Genessee County. 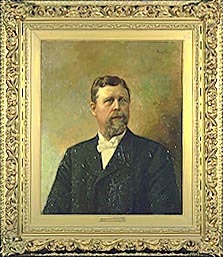 In 1874, Long was elected Prosecuting Attorney and was appointed in 1880 as a census supervisor for Michigan.